As you journey into bead weaving, you'll discover that certain stitches make an appearance in just about every project magazine and bead weaving book. These are the stitches you'll return to again and again throughout your beading career. To help you get familiar with them, we've put together the following list of essential bead weaving stitches. Each description is accompanied by an example switch stitched with loose thread tension, which allows you to see the thread paths. Each of the stitches shown below is in its flat version, which produces a flat length of beaded fabric. In most cases, once you master the flat versions, you can learn how to use the same stitches to create tubular and circular beadwork. With peyote stitch, the thread runs horizontally through the beads, and each bead is vertically offset by the space of one-half bead. When peyote stitch beadwork has an even number of vertical columns, it's called even-count peyote stitch. Even count peyote stitch is a popular stitch for beginners because it's relatively easy to master. 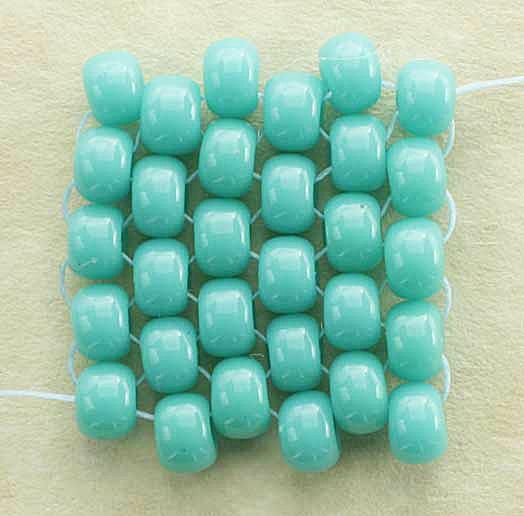 Try stitching it with cylinder beads to create smooth, even beaded bands. When peyote stitch beadwork has an odd number of columns, it's called odd-count peyote stitch. Odd-count flat peyote stitch is slightly more difficult than its even-count counterpart because traditionally it requires that you weave through the beadwork to reposition your needle at the beginning of each row. If you find that method to be too cumbersome, there are two types of alternative ways to approach it: ​the thread turn method and the easy turn method. Ladder stitch is basic beading stitch that you can use to create long bands of beadwork. You can alter the width of a band by stitching multiple beads (instead of one bead) per stitch. Ladder stitch traditionally is used as the first row (or "base row") of brick stitch beadwork (see below). It's also used as a base row in the nontraditional version of Ndebele herringbone stitch. You can perform ladder stitch with either one or two needles. Once you get the hang of it, the two-needle version usually results in a ladder with straighter beads than the single-needle version, where the beads are often slightly tilted. Since ladder stitch is often used as a start for other bead stitches, it is often overlooked. It can be used to make great ladder stitch bracelets and links all on its own. Just like with peyote stitch, the beads in brick stitch are offset by the space of one-half bead each. Unlike peyote stitch, however, the thread runs vertically through the beads, instead of horizontally. Flat brick stitch is also unique in that it is considered to automatically decrease by one bead per row. This causes the beadwork to taper into a triangle. You can take advantage of this taper to intentionally create triangles and diamond shapes. To make rows that are equal in length, you need to perform a simple increase at the start of each row. Many leaders begin brick stitch beadwork with a base row of ladder stitch; however, you may find it easier, to begin with an alternate start. Flat square stitch beadwork is rectangular in shape, and the beads are aligned horizontally and vertically with no offsets. This alignment allows you to design patterns that have square and rectangular motifs. You can also use square stitch to make patterns originally designed for bead looms or for needlework. With this open stitch, each bead is positioned at a right angle to each surrounding bead. The traditional approach to right-angle weave uses two needles: one on each end of the thread. A more popular, modern approach is single needle right angle weave. Because of the gaps between its beads, embellished right angle weave is commonly seen. 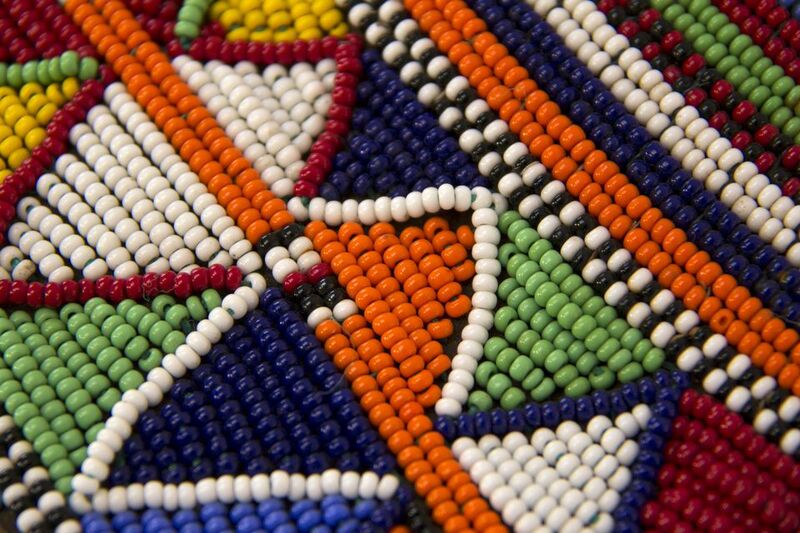 This stitch is believed to have originated with the Ndebele tribe of South Africa. It's called herringbone because it has double columns of beadwork that resemble fish spines. There are two versions of flat Ndebele herringbone stitch: a beginner flat Ndebele herringbone stitch that begins with an initial row of ladder stitch, and traditional start herringbone that does not start with a ladder stitch.